Lucky is rolling out its new lineup of pro scooters and parts for 2016...the Deep Roots Collection. Before designing the next evolution of Lucky products we spent a lot of time looking back at the beginnings of Lucky and the pro scooter market in the US. For our new products we wanted to bring back our extreme focus on quality, strength, and design that built our loyal customer following. We also felt it was important to infuse our Northwest roots into the product and graphics. We are proud to announce the Deep Roots Collection lineup of pro scooters....The new EVO, Covenant, Prospect, and a redesigned Crew, along with redesigned and newly designed pro scooter parts collection. We worked with top riders around the world to design and develop the Deep Roots Collection and spent countless months searching for the best materials, finishes, technologies, and factories that could build to our Lucky quality standards. The result is a collection of pro scooters and parts that is our best work since the beginning of Lucky in 2009. We partnered with a local Northwest artist to design our bottom graphics with true artistic intention. We went wild with wheels! New designs, sizes (120mm), and colors for days! With the new 2016 Deep Roots Collection we were brain storming and searching for something that would represent our northwest roots in a unique, creative way. So when we heard of an amazing local artist named Shogo Ota, founder of Tireman Studios, we had to connect and collaborate with Shogo to create our deck bottom art for our 2016 Deep Roots Collection. Although Shogo hails from Japan, he has called the Pacific Northwest home for more than a decade. Shogo graduated with a BFA from the University of Idaho, which landed him an internship at Modern Dog, located in caffeine city, Seattle, Washington. 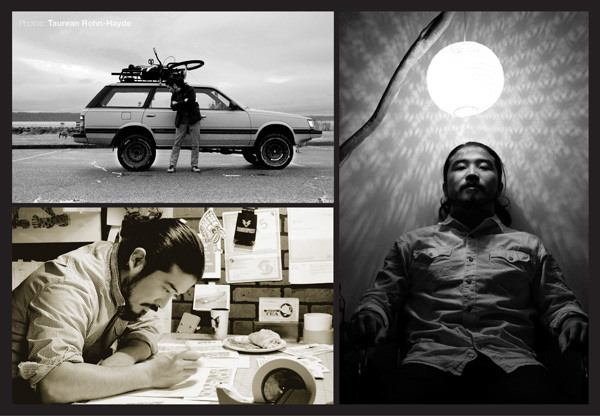 Shogo Ota established Tireman Studio in 2012 with the help of his wife, his cat, his dog, his bunny, and a guy named Peter Shin. He has been teaching at SVC (School of Visual Concept). Everyone at Lucky feels honored and stoked to have colloborated with Shogo on our new lineup and we know you will be even more stoked on the bottom art of the new Lucky Scooter. They are truly one of a kind. We are always teasing parts on social. Either from us directly or our awesome pro riders. Check out these hashtags! !